I have been using this wonderful download manager for a long time. Thanks for developing such a good DM. But I think the UI feels outdated. So I tried to design a improved UI concept based on current UI to go with Windows 10. So here it is. I think It's useful but need some improvements ! It's in first steps and will divide every thing to 2 part one in top and another in down also the setting is in every where we could unite them to a simple one . If every one have any comment I'm ready to know that. All your suggestions for UI changes/modifications can be made here along with some mock-up’s if you do have. 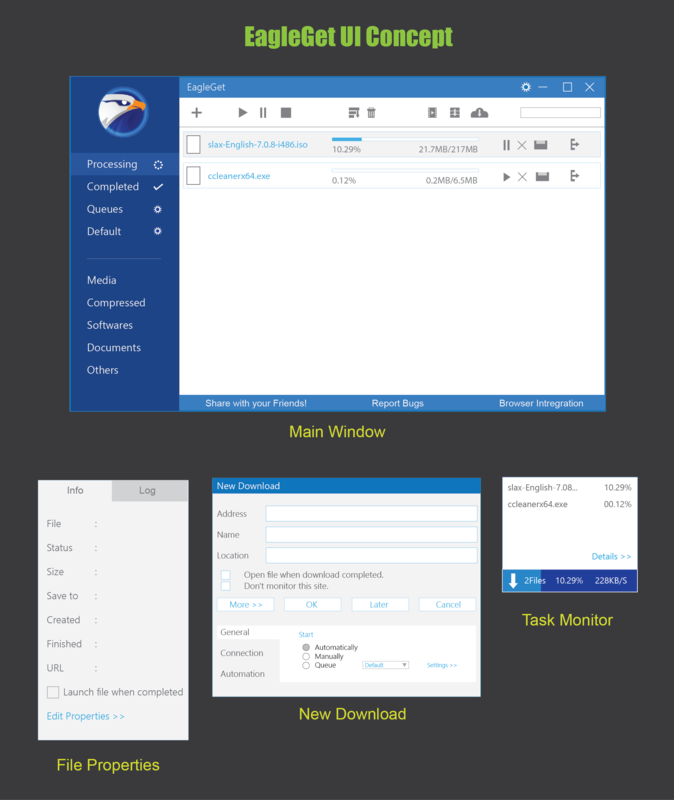 EagleGet's UI is already Simple and Awesome , Adding Some Material Design Might be a Good Idea . I frequently need to use "After completing all transfer [Shutdown]" feature. But I have to turn if on and of almost everyday and going to Configuration>automation every time is boring and irritating. If you bring that option outside it would really help. Also many user don't look at the complete configuration functions, they just check what they need. It took me couple of months just to suddenly discover that eagleget has this great feature. I think many users don't even know this function exists in eagleget. It'll benefit everyone. I frequently use the "download all links" function (for example to download all zip from acer, asus driver pages), but the window is not resizable and I can't select multiple files using CTRL + click or SHIFT + click, this is very annoying when I need to select 20 or 30 files. 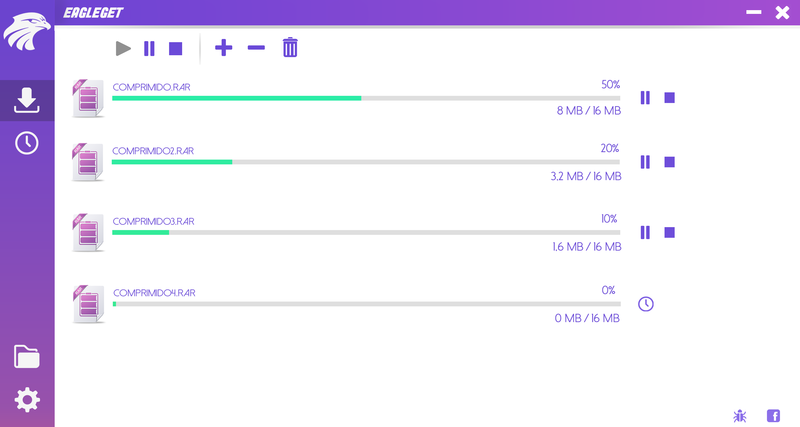 1. please add drag & drop support to the completed download so that user can manage downloaded files easier. many download manager have this feature, so if possible please add it to eagleget. 2. please add sorting by "queue" in the processing list. 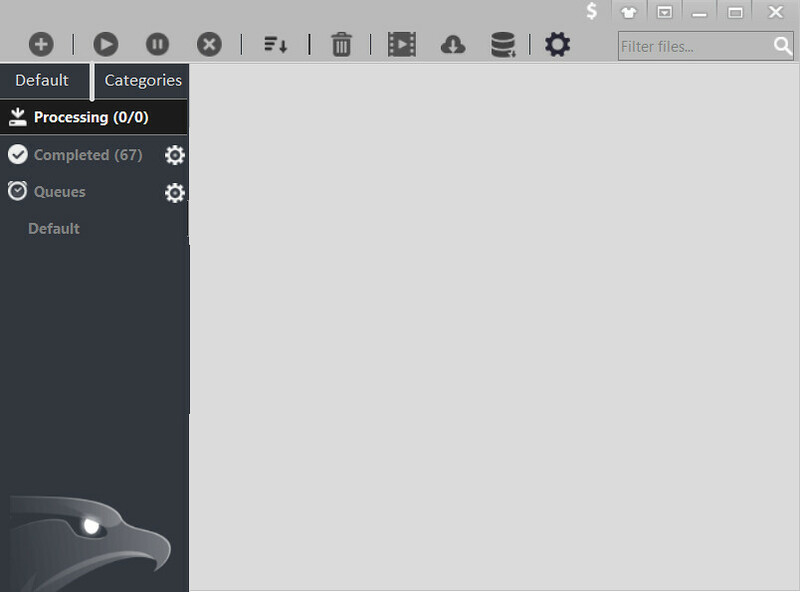 whenever i download multiple files, eagleget always put new download on top. it's not good, and i can't sort by "date" either (it's grayed out). i have to rearrange the queue manually whenever i choose download manually or queues. it should be "first in first out" not "first in last out" like stacks so that i can watch tv series from episode 1 to 12 for example, not waiting episode 1 downloaded after the other 11 episodes downloaded. of course i can rearrange the download queue manually but it's inconvenient especially if i have more than 20 episodes in the queue. 3. please add referrer and description field to the download info and option for user to add or edit referrer or description field manually. this feature is useful when downloading files from file hosting sites. when the download expired, eagleget failed to refresh the address because it only capture the link to the file and the server doesn't allow direct download. it would be great if eagleget can add the referrer automatically like "that famous download manager". it has this feature, in case if it failed to add link to the page that this file obtained user can add it manually in referrer or in description field. the description field is also useful to add note to the download info. whit this feature, user can add note like archive password of downloaded file to the download info so that we don't need to write note of the password somewhere else. Your user interface is so much better than the current one. I hope they improve the UI someday. Small inconsistencies in the current UI (like: not all buttons are of the same size) makes it look awful. But don't get me wrong, EagleGet is my favorite download manager. The user interface designed by sfl is really clean and awesome. Small things like consistent icon sizes, well indented text and whatnot makes the difference. Can I request a dark theme for the UI? The idea is to make sure the program is eye-friendly in dark/low-light situation/room. The inspiration of this dark theme was I always browse the Internet at night. Below is my suggestion for the colour scheme that's fit for the theme that I call Midnight Theme. Sorry for the messy edit. It would be beneficent to those who cares about their eyes. Thank you for taking this in consideration!